Monday Made It…Live from NYC! Woo hoo! It’s Monday Made It time and I’m in NYC! Holy cow! Can’t believe it! Really. I. Can’t. Believe. It. I have the fabulous opportunity to learn from the best of the best…Lucy Calkins…at Teachers College. The August Writer’s Institute looks like it is going to be the bomb-diggity! I’m looking forward to so much new learning…my head is swimming already! Anywho…thought I’d pull all of the stuff I’ve been working on together so that I don’t experience the backup of projects. I tend to feel that my posts have been a tad overwhelming being that I just shifted gears and am starting to panic about everything…new grade level, new teaching partner, new room, new Writers Workshop Units of Study…everything is just so danged bright, shiny, and new…I’m totally blinded by it all! So…here’s what I’ve been working on the last few days. 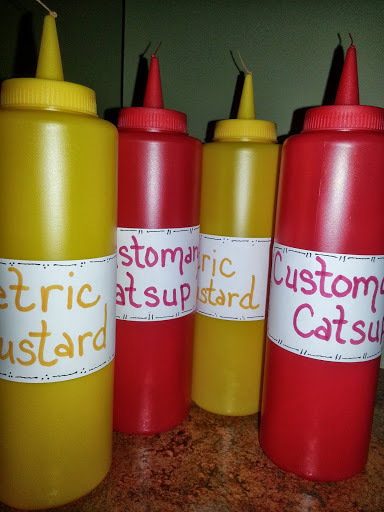 The Customary Catsups and Metric Mustards for my Footlong Measurement Center/Station. I put these together and a while back. Click here to see the original post. I’ve been asked by quite a few folks where I got this idea from. I can tell you…it’s my idea. I’ve never seen these before…they were just something that came out of my warped mind. I put together a few extra to give to my new teaching partner and my “favoritest” teaching buddy, The Wonderful Linda! 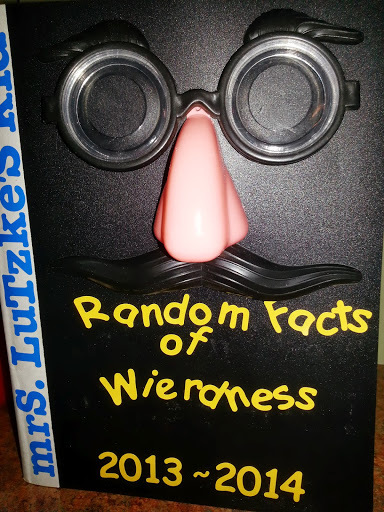 A new “Random Facts of Weirdness” for 2013-2014. My enthusiastic 12-year-old put this baby together for me. He did, however, spell Weirdness incorrectly. I took the picture and am posting it, but do rest assured that this is now spelled correctly. You can find out more about how I use this by checking out my link to last year’s volume here. 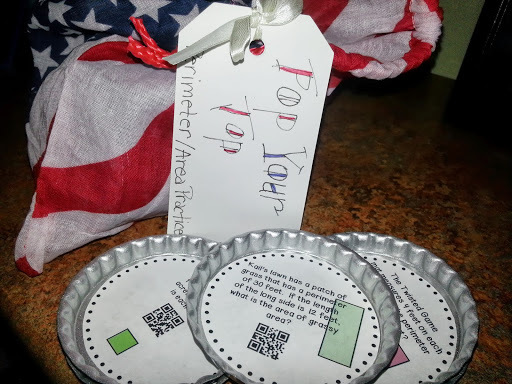 I finished up my “Pop Your Top” station with QR codes for Perimeter and Area practice. The original link to the FREE coaster templates can be found here. Well, I am picturing that this will need a great deal of instruction on the front-end as to expectations at a station such as this. (Note that I am also taking the bamboo skewers and cutting the sharp ends off.) However, you’re the teacher. It’s your call. You don’t need the skewer to make great learning and potential danger happen in your classroom. This could be done with unsharpened pencils, shoelaces or anything else really. The sky’s the limit! Then I put two bamboo skewers in each can. 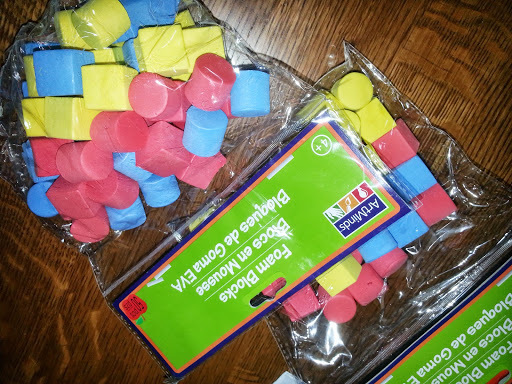 By throwing a handful of these blocks into the can, my students now have a portable sentence creation station. I want them to grab a yellow, blue, and red block and then skewer them onto the kabobs in an order that makes sense. 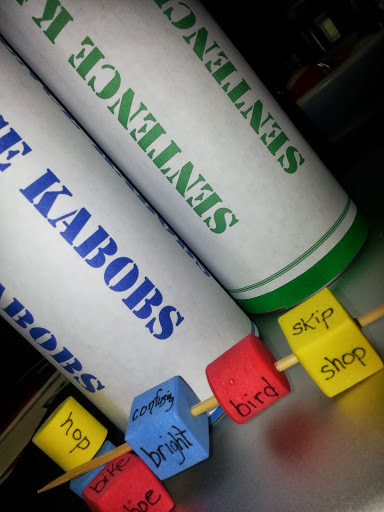 From there, I’d ask students what other words are necessary in order to have their “Sentence Kabob” make sense. This would be a great opportunity to talk about pronouns, conjunctions, or any other part of speech that is appropriate to your situation. I see lots of possibilities here. How about you? I’d have the students write these down in their word play notebooks or on a whiteboard…your call. You know what works best for you! As always, remember that “Sharing is Caring” and that your willingness to make and give a set of these to a treasured colleague, wonderful teaching partner or “brand-new-fresh-out-of-the-box” teacher is always appreciated! I’d love to hear what you do with any of these ideas! Writer’s Workshop has taken over my school and my district and I’M LOVIN’ IT! This soooo fits the way I teach and it is just thrilling to be able to use great mentor texts to model the best in writing. So…enough pontificating…I’m ready to share! Capitalization: The authors take a little bit of liberty with capitalization. My kids catch these “errors” quickly and a quick and necessary mini-lesson on mechanics is born! Show, don’t tell: “I had an idea to give my brother the gift of cauliflower.” “I’m not allowed to give the gift of cauliflower anymore.” The pictures in this book are worth a thousand words. How can we “paint” a picture using words and not drawings or graphics? 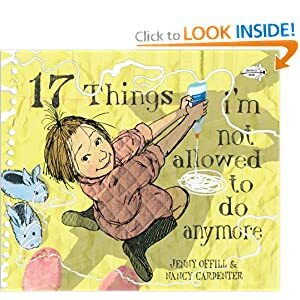 Do you use 17 Things I’m Not Allowed to Do Anymore with your students? If so, how do you use this book with your students? I’d love to hear your ideas! Update for April 9, 2013: I went back to this mentor text and linked it up with the gals over at Collaboration Cuties…check out some other great mentor texts that others have shared!